Technology Look out here I come!!! After reading QuiltSoup's blog and seeing her movie I decided, I had to try it. Well that smilebox thingy is pretty cool but the only pictures I had were of Shelby and her friends being goofy, so she is my test bunny! Now I just need to work the camera and take some pictures of the shop and walaaa a quilt shop movie. (Shelby is the 2nd one in from the left in case any one was wondering) See ya soon!! girls will be girls a Valentines post for Shelby! I truly am growing out of the space at the shop! We have so many new lines in its wonderful!! Today we received Soiree (Lila Tuellers new line) oh wait!! Its not the whole line just the jellies,charms and honeybuns. The yardage will be here in Feb. We also received all the pre-cuts of Swanky, Hip Hip Hoorah plus the yardage in this line, I can't even tell you how cute it is! Don't forget our Open house is this weekend Friday and Saturday, and we have lots of fun things planned for you. Well, we had our monthly late sew at the shop on Saturday night, it was so much fun! but... I accomplished very little. I started a Market bag, which is on our class schedule. But it wasn't my night I cut it wrong, sewed it wrong, and it went downhill from there. So, I guess I will start it over tomorrow. Just wanted to remind you we have a trunk show from Thimble Blossoms. Be sure and pop over to her blog and congratulate her on being on the cover of Australian Homespun magazine. Well I talk with all of you soon! This post is for Shelby and her friends!! I was just checking out her blog because Tom and I think Zane is a really great kid (whom I probably embarass all the time) So as soon as I learn this whole blogging thing I know where I can hijack some pretty goofy pictures of all of them. I love Shelby and all of her goofy friends, thanks for being great kids!! Our new site and lots of Material Girls news! I have so much to tell you that I am afraid its going to be a really long post! First off doesn't our site look great!! Thanks so much Jeanine! She had a little free time, from the Nicky Babe (jk Nick, you know I love you!) 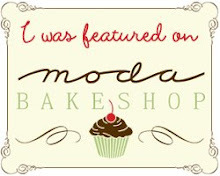 and fixed our site up sooo cute!!! Second, I received a phone call from Nick, (Jeanine's hunky man) asking if I could help him propose to her at the shop! Of course I was all about that, so I had my friend Roxie (thanks Roxie) embroider "Jeanine will you marry me!" We wrapped it in a bolt of fabric, and on Saturday Nick came in, and we asked her to cut a yard of fabric and when she unfolded it, there was the embroidery and Nick got down on one knee and asked her, it was so cute, romantic...., (Nick, you definitely earned brownie points from us quilty ladies) So, be sure and go to Jeanines blog and comment "its sew me" (its on my friends list.) So overall it was a great Saturday!! Now for the next, we have so many new lines of fabric! We have received Valentines (Love is in the air, and Candy Kisses) Hello Betty by Moda, Holly Holderman's new line, the Americana line Hip Hip Hoorah by Sandy Gervais, and lots more! You are definitely going to want to make a trip to the shop!! Our new website is up! yeah!!!! 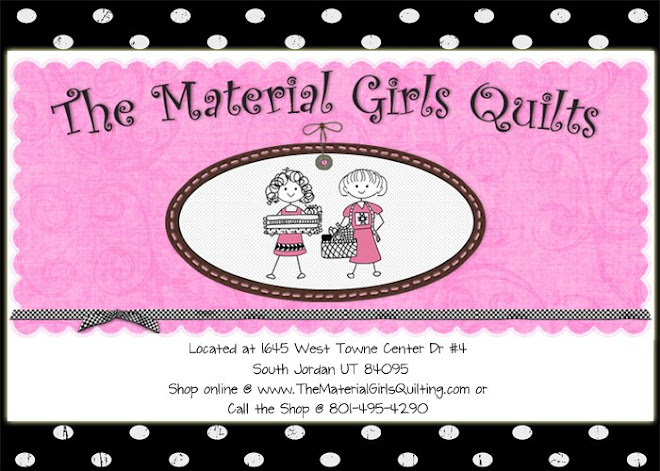 Be sure and check it out www.thematerialgirlsquilting.com I haven't taken a training class so we haven't added any new items, but that is coming soon, (hopefully by the end of the week, gosh! where is that Jeanine when I need her!) Now for the bad news, in the process of changing we might have lost some of our e-mail addresses, so please add you e-mail address to our new site, that is if you want to continue getting our mail which, I am sure you do! Also for those of you who thought our Winter Open House was January 16th and 17th, it has been changed to January 23rd and 24th, sorry! time just went too quickly! but it's going to be worth the wait. 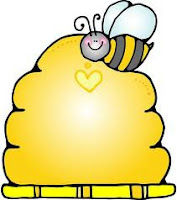 Now for the good stuff, check out our site and then leave a post on our blog and link it to yours to increase your chances (let me know) and I will be drawing for a Jelly Cake (a layer cake, jelly roll, & a charm pack) next Friday January 16th. Oh wow! did time ever get away from me. I took 5 days off from the shop and did lots of home projects, no not sewing! I repainted my kitchen a bright apple green (and if I ever figure out this camera and posting pictures I will show you) I kind of started my Spring Cleaning. I cleaned all my walls in my living room, bought new appliances, new carpet for family room, (truly I think buying a new house would be easier) I am all about the getting organized in 09. I have to tell you that since I opened the shop, things have pretty much gone to ~*/@ in a hen basket, around my house. so..., I truly vow to myself that this is my year to get it together. And lets not forget that I am also going to be up on technology, gosh! I am tired already. Oh well! I am off to clean another cupboard and clean another wall! !